Whether you've purchased yourself a iPhone 5S or iPhone 5C, or whether you're tied into a lengthy contract on the ageing iPhone 4S, chances are you are going to want to use your iPhone for more than just web browsing or taking pictures. With Apple's App store currently populated with over one million apps, there are bound to be some real gems, as well as some duds across all categories. We've searched through and picked out what we feel are the best in order to connect with your friends and family, as well as a look to some alternatives. Obviously, there are some in built options like the Messages app that is tied in so seamlessly with iMessage, Facetime or Apple's preinstalled email application. There are, however, a variety of apps available on the App store designed to complement or replace these. Facebook spending $19 billion on WhatsApp has shot this messaging service into the stratosphere. There is no way of completely replacing the messaging app within your iPhone. Being a locked down system means that Apple has total control, so completely replacing the SMS app on the iPhone is nigh on impossible. WhatsApp was designed to replace standard SMS apps across multiple OS', so is a very comprehensive app and comes with the same features that you would expect from any decent messaging app, with the same features being familiar to anyone that has used WhatsApp before. Rather than using a username or password, WhatsApp works with your mobile number and uses the web rather than the mobile network, therefore meaning that there are no international messaging charges (as long as you're on Wi-Fi while abroad). WhatsApp is very popular across multiple OS' for a reason. Its highly customisable, and very easy to use to message others on the service as it connects via your mobile number. If you decide that WhatsApp isn't for you, why not try Samsung's ChatON? Now available across multiple OS' ChatON is a well designed, comprehensive messaging app that even features a built in translator. 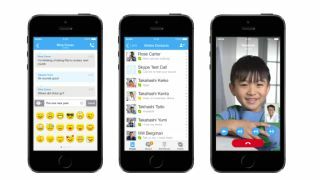 Skype is possibly the most well known and popular video calling service that is available on both iOS and across both mobile and desktop OS'. Now part of the Microsoft family, Skype provides both a comprehensive messaging and calling service that almost renders Apple's FaceTime pointless. Being more than just a video and voice calling service, Skype fully supports IM with Skype's custom array of smileys, albeit without the accompanying fun animations that we love so much. Group messaging is supported, as is the sending of media files and video messages. If neither Skype not FaceTime are the apps for you, why not try ooVoo? Also free to download, ooVoo features video chat at its heart, whilst also supporting group messaging, video statuses and a speed dial. Facebook Messenger has to be one of the most useful messaging apps that you can get for the iPhone, purely down to the large user base that it comes with. Connection to your Facebook account means that you can easily message your closest friends, family and colleagues. Unlike the Android version, Facebook Messenger for iOS doesn't come with Chat Heads. What it does come with is the ability to send voice messages, photos, smileys and the new 'stickers' feature, which comes with massive smileys and cute kittys. Other than that, there is little that can be said for Facebook Messenger. If you'd prefer something a little less native, we'd suggest trying out ChatNow for Facebook as it comes with most features of the Facebook Messenger app, and a customisable look.